The virtual equivalent of Post-It notes, Stickies have a storied history on the Mac, dating way back to the release of System 7.5 in 1994. More than a decade ago, this utility became something of an afterthought for Apple, who evicted the cute little squares from the Finder beginning with OS X Tiger, where they settled peacefully into retirement as Dashboard widgets. 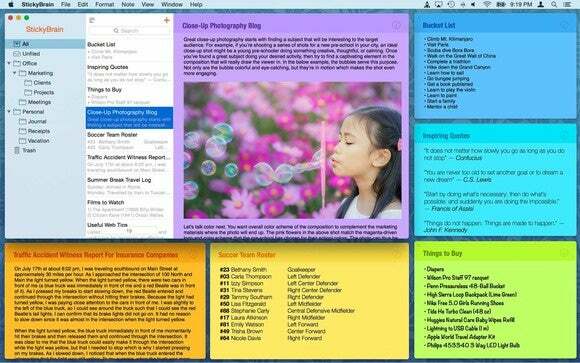 Perhaps sensing Mac owners had bored of colorful desktop notes, developer Chronos soon abandoned its own third-party take on the concept. Apparently you can’t keep a good sticky down, because StickyBrain has been resurrected for a new generation. But can it remain relevant in a mobile-first world? StickyBrain retains the familiar look and feel of Apple’s built-in Notes, but with new improvements like hierarchical folders and assignable background colors. The contemporary StickyBrain starts completely from scratch as an entirely new application, rebuilt from the ground up using Apple’s new Swift programming language. The result is a leaner, faster note manager that makes it easy to find whatever you’re looking for in a snap and organize information using hierarchical folders. Chronos likens StickyBrain to a “really big drawer” where users can deposit scraps of information, including screenshots, photos, and text files imported from Microsoft Word, TextEdit, RTF, and HTML files with basic formatting intact. If you’ve managed to hang onto your old Apple Stickies over the years, StickyBrain can import those as well, freeing them from a Dashboard-only prison. Naturally, StickyBrain retains the whimsical color schemes that made Stickies popular in the first place. Note backgrounds can be assigned 10 different colors, or kept plain white, should you prefer not to get too fancy. There’s no support for custom colors, and I found a bug where the default note color set in Preferences refused to stick (pun intended) until I selected it again on the actual note. 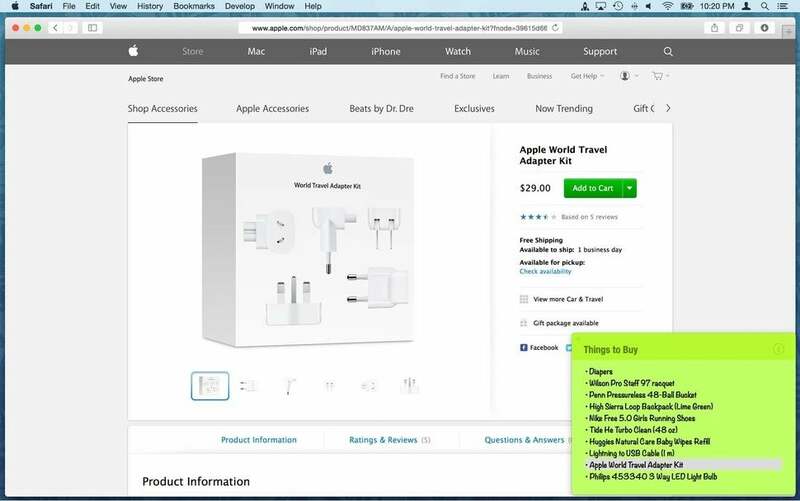 One of the neatest StickyBrain features allow applications to be attached to notes as reminders when shopping, for example. StickyBrain follows the familiar three-panel approach used by Apple’s built-in Notes, with a list of notes in the center and a viewer at right, but here the left panel displays All, Unfiled, and Trash views, as well as custom folders created by the user; subfolders can also be added for better organization. Although StickyBrain notes can’t actually be attached to the desktop like Stickies could, they’re not strictly confined to the viewer, either. As long as the application is open, notes can exist in their own windows, where they can be viewed or edited directly. Taking this freedom one step further, StickyBrain also allows other applications to be attached to notes. For example, a list of products you intend to buy from Amazon or another online destination can be configured to automatically hover above the web browser as a reminder on your next virtual shopping trip. It’s a handy and unique feature I haven’t seen before. 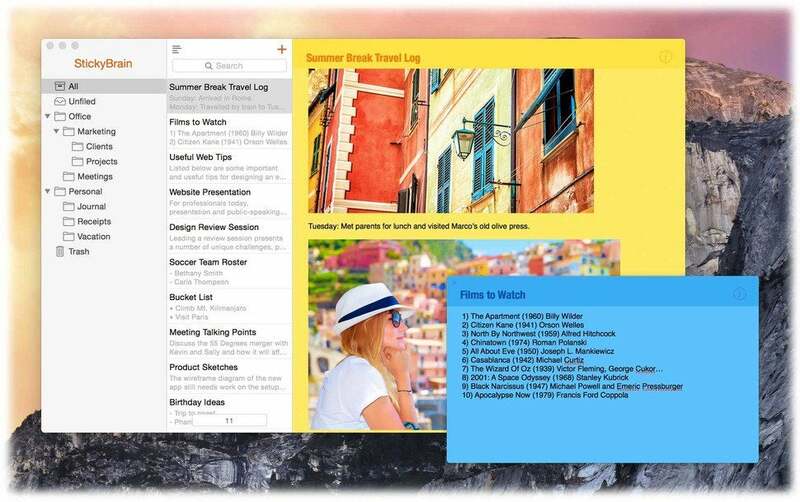 StickyBrain notes don’t only have to live in the viewer, but they can’t be stuck to the Finder desktop the way Apple’s Stickies once could. Unfortunately, Chronos brought StickyBrain out of retirement on the heels of Apple introducing enhancements to its free, built-in Notes with OS X El Capitan, including the ability to create checklists and add photos, videos, web URLs, or map locations directly from other apps. That makes it tough to justify spending $30 on a less-capable third-party solution. Worse yet, StickyBrain lacks support for syncing to iCloud and popular cloud services like Dropbox, meaning users who abandon Notes would have no way to view or edit their library from an iOS device. It’s a curious omission considering the previous version included sync with Palm and iPod devices, a rather forward-thinking concept in the pre-iPhone era. StickyBrain is fast and clean, but I did find at least one bug where the application fails to remember the default background color. StickyBrain is a slick Mac note manager with several niceties like attaching applications to notes, but the lack of mobile sync and the looming shadow of improvements coming to OS X El Capitan’s built-in Notes make this a cautious recommendation for now. StickyBrain returns after a 10-year absence in an attempt to make virtual Post-It notes on the Mac cool again.